Now with film number five in the dead series we have what Romero called a "rejigging of the myth". We go back to the very first night when the zombies appeared and follow the experiences of a new group of people. However it's also all moved up to the present day (2007). A time when we all have the Internet and everybody in the first world has some kind of camera. It is shot using the "found footage" style made famous by the Blair Witch Project and presented as if it was a documentary made by the people in the film, recording as they go. This gives it a very different feel from any of the other dead films but it's not a bad one. 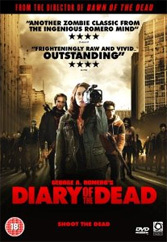 I think I like it better than Land of the Dead because we're back to a small group of people struggling against the odds and learning about zombies. Although this time a lot of their knowledge comes from You Tube and MySpace, at least until the mobile carriers stop working, which is something I can understand. It's not perfect though. They are many moments when the camera work is far too smooth for a student with a camera on his shoulder and there are even more times when people would have survived had they just put the cameras down and helped a bit. Still overall a much closer return to form from Romero when compared to Land of the Dead. That's an interesting point, that you felt that if people had put the cameras down and helped, some people might have survived - interesting that you felt it even in a work of fiction, which is a kind of tribute to its documentary qualities, if you see what I mean. It's the perennial problem of reporters of wars, disasters, etc - at what point do you stop recording events and in the name of humanity, just try to help?